If you garden much, you become very familiar with transitions. Moving from one phase to another is a pretty common occurrence when you are dealing with soil, seeds, plants, sun and rain. My flower gardens are ending a big transition right now. The fury of Spring blooming is coming to an end and we are now entering the Summer period when bloomers tend to act much more slowly, but the beauty seems to be worth the wait. Take a little look at what’s happening in the gardens right now (you can click on any picture to start a slide show). A great year for ferns in my garden. Underneath is a Japanese painted fern (athyrium niponicum) ‘Pictum’ and on either side is a young autumn fern, another Japanese variety (dryopteris erythrosora). How pretty is this hydrangea ‘Anabelle’ bloom in its first phases of blooming? A trio of rose buds just about ready to bloom. One of the original roses that was here when we moved to Glen Road seven years ago. A little yellow flower blooms from one of the feathery coreopsis growing all around my garden. Another favorite perennial here on Glen Road. The coreopsis shown is ‘Moonbeam’. 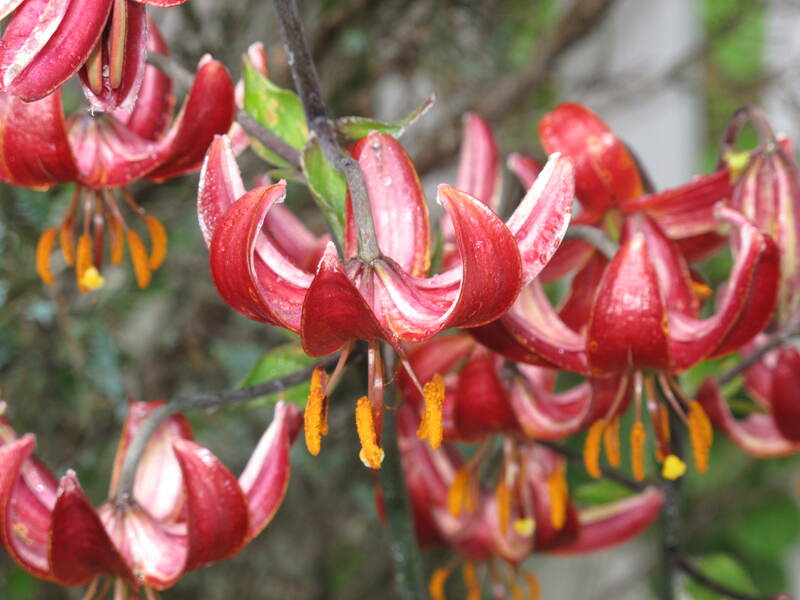 A strong standing of red martagon lilies (lilium martagon) ‘Claude Shride’. So many blooms on each stem of the red martagon plant. A must-have bulb for your garden. One of my blooming red martagon lilies (lilium martagon) ‘Claude Shride’. I didn’t have much luck with these in years past due to the destruction caused by the red lily leaf beetle. This year I worked hard to get rid of the beetles as soon as they arrived and this is my prize for being do diligent. Another heuchera in my garden. This one is ‘Palace Purple’, a very common perennial in gardens across the Northeast. Heuchera ‘Caramel’ growing in my garden. This is one of my all-time favorite perennials. One plant that I always “go to” when I need something to fill a little spot here or there. This entry was posted in Gardening, Life, Nature and tagged Acorns, Beauty, Blog, Fun, Gardening, Life, My Life, Nature, Photos, Spring, Thoughts. Bookmark the permalink. Great garden and beautiful photos- thanks for sharing..
Hi putneyfarm. Welcome to Acorns On Glen. Thanks for the comment and thanks for visiting. Come back soon.